I may have been somewhat of a critic in the past towards Democracies, and while it certainly has its failings, the alternatives are certainly not much better. In a way this is one of the major factors behind the First World War, and while it was a horrific bloodbath, in a way it was a war between what had become the advanced Democracies of France and England and the monarchies of Germany, Austria, and the Ottoman Empire. Looking at the fallout from the war, and the options that came about afterwards, even the harshest critic of democracy would be hard pressed to want anything else. Anyway, I have recently finished reading the memoirs of the poet Robert Graves called 'Goodbye to All That', which is basically his experiences fighting on the Western front, with his childhood and a few other things thrown in for good measure. As I was reading it though it made me cast my mind back to my travels through France and Belgium to the battlefields of Ypres and the Somme and spurred me on to write about them sooner rather than later. 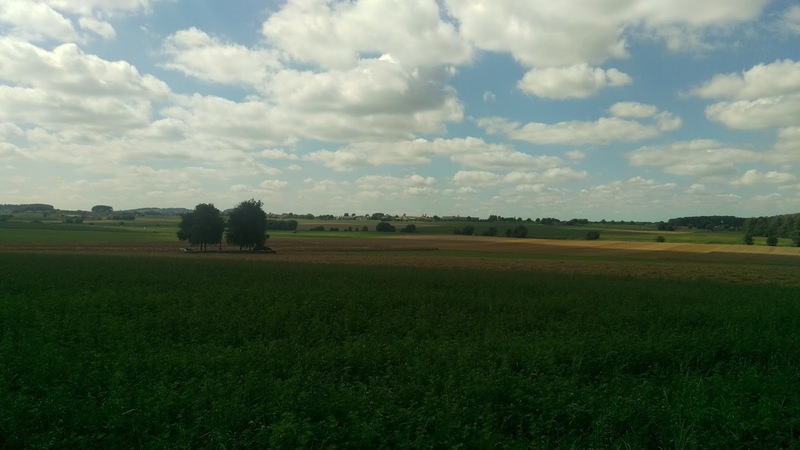 I'm not going to write about my travels through that part of Europe because that is a topic for another blog, however I will instead write about what I learnt there. There are a number of tours around the region, and since I'm Australian the tour guides automatically take us to sites that are specifically Australian. Mind you, at the time Australia was still part of the British Empire, and was still in many cases ruled from London. 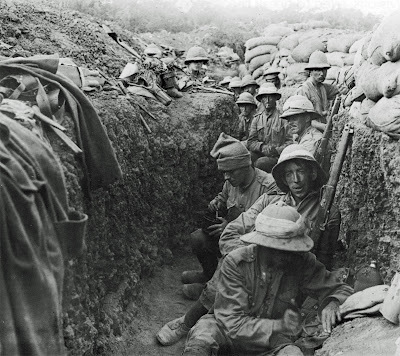 This meant that while the Australian troops formed their own battalions, they tended to find themselves fighting alongside the British, and being moved along the British trenches as was needed. One thing that does come to mind as I write this was the attitude towards the British as I was growing up. The statement was 'we have always spilt blood for the British, but when we have needed them they were nowhere to be found'. This relates back to World War II in particular where the Japanese were advancing upon us from the north and the British simply weren't interested in providing us with troops because, well, they were needed elsewhere. Instead, after Pearl Harbour, it was the Americans who ended up coming to our aid. I'll begin with the small town in Belgium named Ypres. The town is located in Flanders, which happens to be the Dutch part of the country. Interestingly they speak two languages in Belgium - French in the south and Dutch in the north. Well, not quite Dutch since the language is actually Flemish, which is a little different. However, I have noted that it is generally considered to be Dutch, and even people that I spoke to while I was there, while not correcting me when I referred to the language as Flemish, basically suggested that it was simply a dialect of Dutch. Still, being who I happen to be, I'm going to refer to it as Flemish, since if we get technical, French, Italian, and Spanish are little more than dialects of Latin. Ypres was basically flattened during the war, and when you wander around the town all of the buildings that you see were built during the 1920s. This isn't really surprising considering that the typical battle along the western front consisted of one side firing artillery at the otherside for days on end, and then sending troops over the top of the trenches only to discover that the artillery barrage basically didn't work and the soldiers were gunned down by the machine gun emplacements positioned along the enemy trenches. As such, towns and villages within range of the front line inevitably were caught up in the barrage, and after four years of this there was basically nothing left. 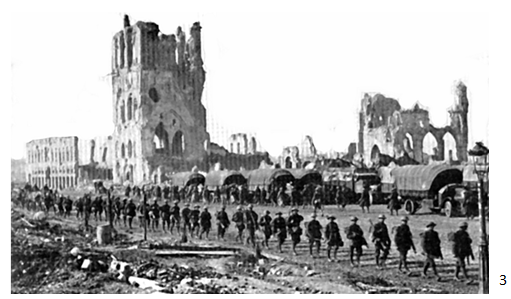 Still, if you look at photos of Ypres, you will notice that the town hall did remain standing, to an extent. One thing that I noticed as we traveled around the countryside were the number of cemetaries. I can't remember how many there were (there are 160 of them), but you will find these cemeteries scattered all along the Western Front - some quite large, some small - though all of them have a mix of soldiers from the various armies. The reason for this was that back in the days of World War I, the soldiers were basically buried where they fell, namely because the technology didn't exist to transport them back home. 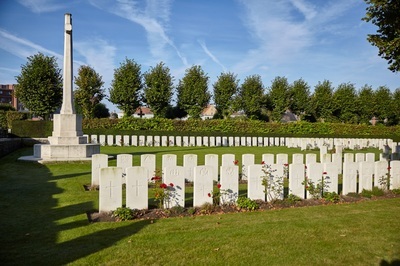 One of the things that you do on these tours is visit some of the cemeteries, usually those that have a number of dead from your own nationality, and many people travel here to find the graves of relatives who fell during the war. In Ypres is also the Menin Gate, which is a huge arch at the entrance to the town centre upon which is inscribed the names of all who fell in the area. Not surprisingly the list of names is quite extensive, and the gate itself is quite large as well. At 8:00 pm every day the Last Post is performed, where some British soldiers lay a wreath at the memorial. This ceremony has been performed every day since the end of hostilities, and the only time that it wasn't performed was when the Nazi's occupied the town, and even then the ceremony was continued back in England. As soon as Ypres was liberated, and while there was still fighting in the streets, the Last Post ceremony was reinstated, and has been performed every day since. 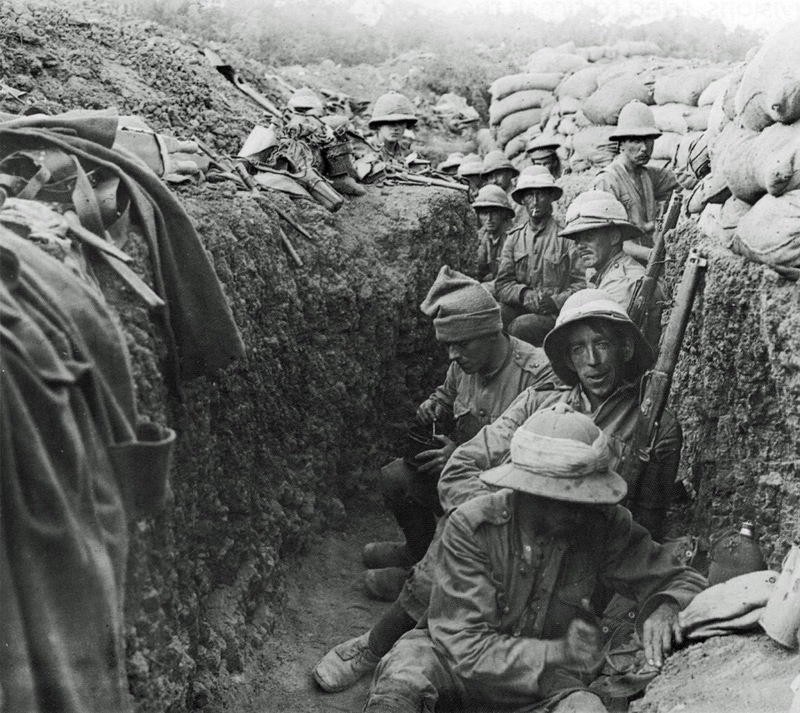 Before I move onto the battles themselves, I should mention a few words about the trenches. If you travel to the Western Front to see the trenches then unfortunately you aren't going to find all that many. The reason being is that after the war the last thing people wanted to be reminded of was the war, so the trenches were all basically destroyed. Well, that and the fact that during the war the neverending bombardments would also destroy the trenches, and in the hundred years since, the elements also worked their ways on them. However, as you travel around, you will still find some, namely because land was gifted to various countries as a memorial, as well as some people purchasing the land for similar reasons. Around Ypres there was also some trenches found by some children playing in the woods, and they have also since been preserved. However, if you know where to look you can also find some German bunkers. The reason for this is that the Germans built their fortifications quite effectively, and no matter how hard people have tried, they simply cannot remove them. Farmers have even tried blowing them up to no avail. 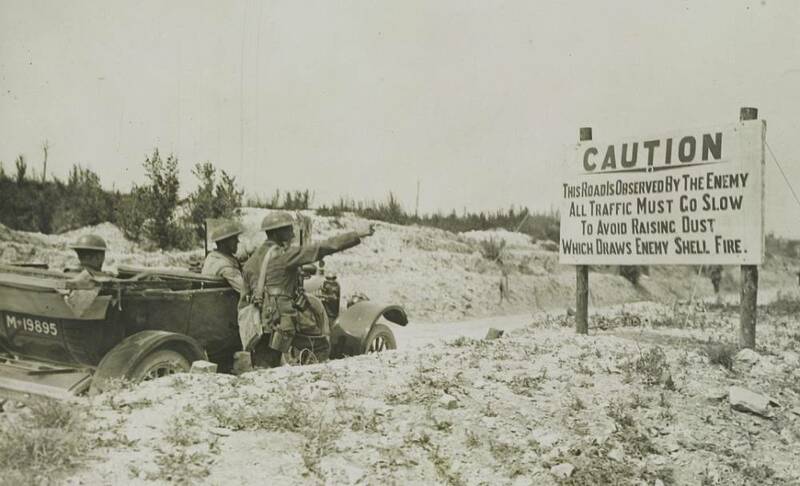 The allies always thought that the end of the war was just around the corner, so never saw a need to build effective fortifications, however the Germans saw the war differently - the Western Front was their border, so they built their fortifications so as to withstand even the heaviest attacks. Another thing that I should mention is that it is still possible, even after a hundred years, to find relics from the war. if you drive through the area you will still find tonnes of barbed wire and other stuff piled out the front of Farmer's houses waiting for them to be disposed - they are still digging them out of the ground during planting season. Oh, and if they want to build something, they still have to bring in the bomb squad to make sure that there are no unexploded ordinances lying about. I'm not really sure if I can really call this a battle, considering that battles suggest a war that is fluid, as opposed to the Western Front, which was basically static for a majority of the time. As I have mentioned, the battles seemed to consist of bombing the opposing trenches and then sending troops over the top to basically get gunned down by the enemy. However, historians still use the term battle, particularly since there were some objectives to meet. The situation at Ypres was that the Germans were using the Belgium ports as staging points for their submarine fleets. The Germans basically didn't have a navy, thanks to the British victory at the battle of Jutland. Therefore, pretty much all of their fleet (both merchant and naval), were confined to their harbours due to a British blockade. As such they resorted to an invention that had been around since the 1600s - the Submarine. The problem with the submarines, for the British at least, was that they were able to take out their ships but the British simply were not able to detect them. As such, these menacing weapons of war effectively provided a counter-balance to the might of the British Navy. So, the objective was to break through the German Lines, march on the Belgium ports, capture them, and take out the submarines. Sounds like a pretty decent plan, except the problem was breaking through the German Lines. So, like they had been doing countless numbers of times in the past couple of years, the strategy was to bombard the opposing trenches with artillery, and then send the troops over to top and capture the enemy positions. Well, we all know how that turned out, don't we. Terrain is always important in war, and taking advantage of the terrain can mean the difference between winning and losing a battle. The thing with the terrain around Ypres is that it is flat - really, really flat. Also, it is very, very wet - there are French films that portray this part of Europe as basically raining twenty-four/Seven. When we were here we were taken up to the top of a relatively small hill and shown around, and from where we stood we could see all the way to the city of Lille. So, this terrain was quite important to the belligerents, particularly since the Germans had managed to capture the higher ground, which made it even more difficult for the Allies to advance. The weather also played an important role, particularly since much of the war involved lobbing artillery shells at the opponents. So, lots of artillery breaking up the ground, and lots of rain really brings about one result - lots and lots of mud. World War I was a war that was literally fought in the mud. There are stories of the trenches being horrid places to sleep, with rats, water, and mud being a constant hindrance to the soldier's daily lives. Further, moving about, and digging, was a difficult task at the best of times, and basically attempting to storm an enemy's position while slogging through mud simply did not make for an enjoyable time. This is where I come to the story of Hill 60. Yep, basically the hills were all assigned numbers, and Hill 60 was basically the highest point in the region, and the German's controlled it. That basically meant that they could see everything that was going on in front of them, and also have a somewhat greater range for their weapons. So, something slightly different was devised to attempt to capture this point - instead of going over ground, the troops went under. Basically the allies (namely the Australians), tunneled under no-man's land, and began to lay an incredible amount of explosives under the German positions. This was actually done at a number of places along the lines. The idea was to detonate the explosives all at once, and then move in to capture the German positions. Also, the benefit was that since the explosives were underground as opposed to being lobbed over no-man's land, it meant that the German's weren't able to shelter from the barrage. The problem was with the timing, and waiting for orders from the generals. For this to work, they needed to set off the explosives all at once, but unfortunately this didn't work. The remains of Hill 60. At the time the Battle of the Somme was raging, so the belief was that since the German's were occupied down there, they would have a better time of being able to break through here. The end result was that they didn't, and they had pretty much under-estimated the Germans. Further, the Somme was drawing a lot of resources, and the mines weren't detonated simultaneous either. Sure, they managed to capture the hill, but that wasn't a huge success because the hill had literally changed hands sixteen times. If you do end up down here, you will discover that the craters are still present, and in many ways have become places of reflection. 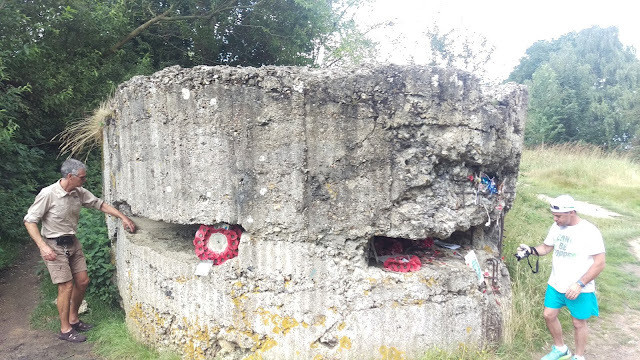 Also, the bunkers on Hill 60, are also still there (the Germans built then really, really well), and they have even placed markers in the area to mark where the lines were (ignoring the fact that they did change regularly). In some places they were so close that one could get over with little trouble, except for the machine gun emplacements preventing you. Oh, and there is also a railway line nearby, which was present during the war, though considering the amount of artillery was was dumped on the area I'm not all that sure if it would have been all that useful. As it turned out the location of the famous Christmas Truce was in the local area, and a memorial has been set up to remember it. 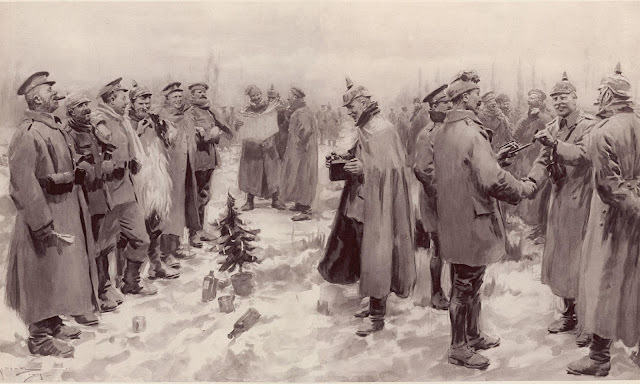 For those who don't know, the story goes that on Christmas Day, 1914 (ironically the day that the war was supposed to have been finished), all of the generals went home to spend time with their families, while the soldiers were left to celebrate Christmas in the horrid surrounds of the trenches. So, while sitting there, one of the British soldiers tied a white flag to the pole, waved it over the side of the trench, and cried out 'Nicht schießen! Nicht schießen!". The Germans agreed, and both sides climbed out of the trenches, and both sides agreed that they were pretty annoyed that the generals had all gone home leaving them in this god-forsaken hell hole, and that neither side wanted to be there, let alone fighting each other. So, they decided to do what most Europeans do when in this situation - they played soccer. In fact they played soccer, talked, laughed, and had a jolly good time right up until the generals returned, horrified that the troops were having a blast. So, doing what Generals tend to do in situations like this, they basically reprimanded the soldiers, told them to get back into the trenches, and go back to shooting each other. In a way, this event isn't all that surprising, especially considering the attitudes of the soldiers and the generals. As was the case with World War I, this was an industrialised war where soldiers simply became machines in the cogs. Further, this was a dispute between the ruling parties as opposed to the people at large. As Graves suggested in his memories, in the trenches there was actually a lot more animosity between the British and the French than there was between the British and the Germans. Anyway, I'll finish up here, and continue in a further post with the Battle of the Somme. 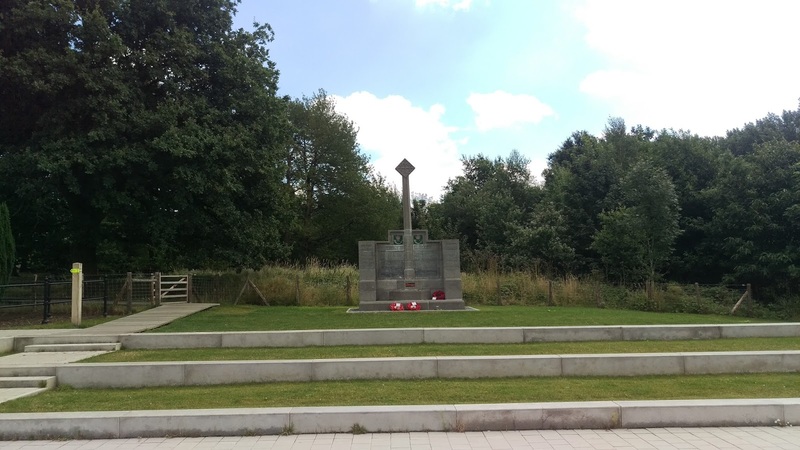 Tourist information, and other facts, regarding the Ypres Salient. An Australian government site regarding Hill 60. 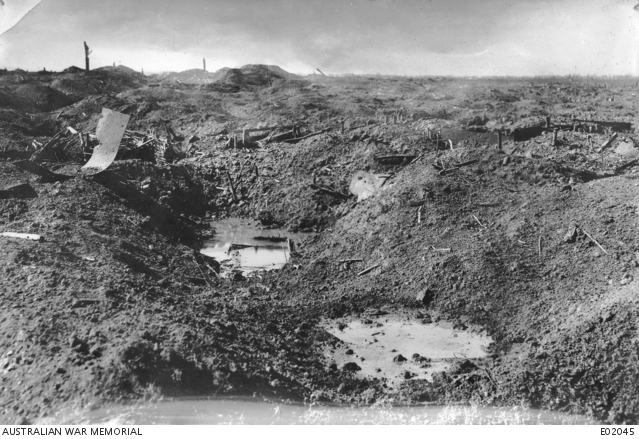 Another Australian site regarding the battle of Hill 60. Details regarding the Christmas truce of 1914. Oh, and there is also a movie called Beneath Hill 60. World War One was a total bloody stupid waste (and, since the ending was botched, World War Two was essentially the second round of the first war.) You are correct that it was (along with the second war) essentially the last gasp of the 19th Century idea of monarchy and war as a means of national pride. I guess it was just too ugly to be loved like prior combat. My great-grandfather fought in the trenches in the first war, was gassed, and was never the same. (I never met him - he died of lung issues and alcoholism long before I was born.) Sad too how many great men died early - poets, writers, musicians, you name it. On a related note, I think modern anti-war thought really stems from WWI. It would be fascinating to see these sites. I haven't been out of Paris when I visited France (except for Versailles), and never got to the low countries.